Dr. Islam is a microbiologist with over ten years of experience in research and teaching at the university level. Dr. Islam’s research interest is in the areas of HIV pathogenesis with major focus on coreceptor-utilization. He completed his postdoctoral fellowship at the Johns Hopkins Bloomberg School of Public Health where he worked on evaluating inflammatory biomarkers among HIV/HBV/HCV infected intravenous drug users (IDU) in the ALIVE (AIDS linked to IntraVenous Experience) cohort study. Dr. Islam has experience in research-project management, and he frequently gives scientific speech at domestic and international settings. 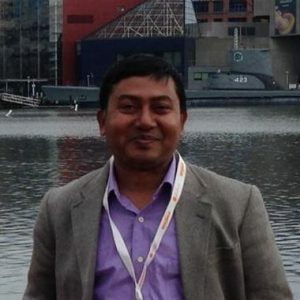 He is currently Associate Professor (Microbiology) at Jahangirnagar University, Savar, Bangladesh.